Since becoming a parent almost 9 years ago, my perception on life has circled many times. When you see life through the eyes of a child, it takes on a different meaning. Well, I sit here in the hospital with my mother. I think back to the numerous times she sat with me. I have had two broken arms (same arm), a messed up wrist that required being in the ER, a wreck that was too close of a call, (she has always said, I talked God's ears off, so He decided He wasn't ready for me yet! ), two knee surgeries (same knee), an ovarian cyst removed, a concussion, and 3 babies. WOW! I think I have frequent flyer miles or some reward system. She never complained, she was always there, she got a little mean at times, she made me eat, drink, walk, do whatever the Dr. says, sleep, rest, she motivated, she insisted, she was calm, and she didn't go home until I did. Well, we don't know exactly what is wrong with her yet. Lots of tests are being done and we will keep testing until we figure it out. I have been up here as much as I can. With my girls that has been limited. I saw in her eyes she needed me here, so I ditched my children onto Laken (you are such a sweet, life saver and poor Daniel!) and I am here camping out. I have had to make her shower, eat, drink, sleep, rest, get up, motivate her, be quiet (not too easy for me! ), and I have had to get mean with her. Boy, how time changes. I can tell she is dependent upon me. My dad is here and is trying so hard, but bless his heart, he is annoying her. I know so many times I was so glad Kirk was by my side, but when my mom got there; I knew things would be alright. I can sense that in her. I don't know that I am ready for this. I am supposed to be dependent on her, I am still the child. No. No. My time has circled. I am now the adult. I am now making decisions. I am now looking out for her. It's not easy. I am truly saddened. Their are some passing of the batons I just didn't realize were already here nor was I ready to stick my hand out and receive it. So, I am up typing in the peace and quiet, nothing but the sound of the fan, clock ticking and a small sound of a snore from a finally resting child. I occasionally lean over and take a peek to observe and then go on about my business. I won't sleep well, and I know I will be up several times through the night. I am the caretaker - and I shall play my part. As we were getting ready to go to the beach that we had talked about for weeks, we were staying at a hotel for one night. We had been at Fiesta Texas all day and were exhausted. When we got to the hotel, the kids saw the pool and were begging to go swimming. Little Tater saw the pool and was amazed. She was so excited and thought it was the beach. (it was an extremely nice pool - especially for a cheaper hotel!) I kept telling them that we weren't going swimming at 10:00 at night b/c we were headed to the beach. the next day. They kept crying - "please, look at the pool, mom, let us swim." I replied, "I know that pool is nice, but wait until you see where we are going tomorrow." As soon as I rolled those assuring words off my lips I immediatley thought about how God feels towards us as our Father. We want things, we are awed by things and places, we need this, we cry for that. I can just hear him - "But Amy, this is nothing. Wait until you see Heaven." For the first time in my life, something that had always been unfathomable - hit! That is really sad to say since I have been a christian for a long time. However, I see through different eyes as a parent. We can fix our eyes on what we think is great and some things are beautiful. We do have some wonderful things here on earth - if the beach is earthly, what will Heaven be like? So, when you are having that bad day, or your house won't sell and you are moving in 3 weeks; have no stress, wait until you see where we are going tomorrow. Since my last post is about St. Patrick's Day, I guess it has been a long time since I have posted. ya, think? Well anyways, Facebook has taken over in the keeping up with things, but I guess I miss my old "journaling!" I want to use this blog to write about the daily things that happen that allow me to see God working in my life. I will change the title and header and all that when I get a chance; 1:00am on vacation is not the best time! I will start next week with my first post. It will be about all that is happening in my life and an update on our family. Then I will make the transition! Hope all of you are well and will come back to my page to check it out. I will send a notice letting you know I updated! My Little Girl is Two! It seems it was just yesterday we were celebrating Valentine's at home because we had just come home from the hospital. She has grown up so fast - and is getting bigger every day. She talks all the time (she gets that honestly!). She wants to potty train (mommy is not ready) and she is asking to sleep in the big bed (again mommy is not ready!) She wants to be so big like her sisters, but mommy really wants her to be baby...... We had a party for her Friday night since I had to cancel it last weekend. Both grandparents were going to be here for her original party, but with the way life happened, we kept it to some close friends. She was so happy to have birthday cake - that is literally what she asked for! Posing so big and two for the camera. 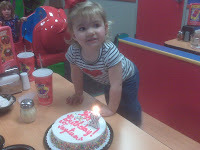 On her actual birthday, we took her to Chuck-E-Cheese. She is an official fan now and wants to go "eat pizza and play" all the time; as she says it. Happy Birthday, My Beautiful Not - so Baby Girl! plans can change in one phone call! However, this is how the week has gone! Tues - drove two hours to Marble Falls to honor mother-in-law at a ladies' dinner. got in a hail storm got home at midnight! Fri - cancelled party maybe next weekend? WOW! a phone call makes such a difference in our lives. we never know what is on the other line when we simply say, "hello." This has been so sad for us. My grandpa started this business and built this shop in 1948. Then my dad has worked at it and partly owned and when my grandpa passed away completely owned this business. It is our family, our whole lives were this shop. Please pray for my dad and his company as they travel the upcoming journey. Well, Kirk has been gone for two weeks........so, I am stressed, tired and a lacking patience. However, Alayna has been in Lubbock at my parents' house all week. She went down to Lubbock with some friends last Friday and has stayed the whole week. She is a lot like her mommy - loves being gone and doing big things! It has been easier only having two children. Alayna has learned to ride her bike without training wheels. She is fast and fearless, so we are going to have to invest in a helmet. On Tues Syd was trying to help me out and got a roast that I was warming up out of the microwave. She managed to get it out, but she spilled it trying to put it back. She burned herself from her neck down to her waist. It is healing nicely, but is still scary! On a brighter note, she wanted her haircut, so I gave in. It looks really pretty and she looks so grown up. Taytum is wild and crazy. She thinks she is 5 years old. She talks so well for an almost 2 year old. Everyone thinks she is 3. She mimics big sisters and loves to do what they do. She loves to dress up, talk on phones and is constantly making us laugh. I am preparing for my marathon. I am 4 weeks away and I am getting rather anxious, nervous, scared and ready to get it over with! Not much else is happening. We also have Taytum's 2nd b-day coming up. I bet that will be my next post. So off to grading papers and trying to get everything done. I have been married to Kirk for 12 years. We have three beautiful girls. Syd is 8, AJ is 5, and Tater is 2. We are in the process of moving to Idalou. I will be teaching 8th grade English and coaching in the high school.